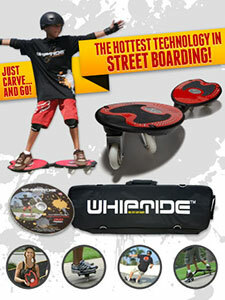 Whiptide is the hottest technology in street boarding, just carve and go. The unique design and engineering features allow you to effortlessly carve like you’re on a real snowboard or surfboard riding the wave. Whiptide is perfect for all ages, and the effortless movement required allows you to ride smoother than you could with any other board.